ZAPORIZHZHIA, Ukraine -- Russian ships last month rammed, opened fire on and then seized three Ukrainian naval vessels in the Black Sea, triggering fears of an potential invasion. 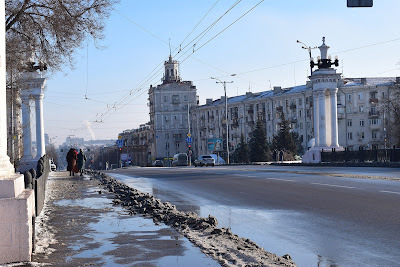 Zaporizhzhia's main street after martial law was introduced. Larysa Spitsyna was shocked and confused when she learned her city would be placed under martial law. In Ukraine, that allows the military to requisition private property, mobilize civilians, ban mass gatherings and stop the sale of alcohol. Poroshenko said it was necessary in response to "an act of aggression" and claimed Russia was amassing tanks at his border. Days after the sea clash, Moscow also announced it was deploying an additional S-400 surface-to-air missile system to Crimea, the peninsula it annexed from Ukraine in 2014. While initially concerned, Spitsyna said she was reassured when university officials said operations would continue as normal. She voted for Poroshenko during the last election in 2014 and backs the president's decision now. "I think this measure is a way we can gain more safety at the moment," she said. "I think it will improve Poroshenko's ratings." In 2014, Russian-backed separatists began fighting Ukrainian government troops in a conflict that has rumbled on for more than four years and claimed more than 11,000 lives. The rebel-controlled area is just 161 km (100 mi) from Zaporizhzhia. The same year, some 193 km (120 mi) to the south of the city, Russian forces annexed Crimea, a move deemed illegal by the United States and most other Western countries. Back then, in the height of Ukraine's crisis, the newly elected Poroshenko did not declare martial law. So why do it now, asks Evgenia Ivanova? "Every day we had the fear that [Russian tanks] can move to Zaporizhzhia and drive on our main avenue," said Ivanova, who works at a travel agency. "Why was martial law not imposed in those times?" Some critics have made the same point, alleging that Poroshenko did not impose martial law in 2014 because it did not suit him politically. Last week, he initially announced the move would be deployed country-wide for 60 days. Now that it's here, martial law is affecting Ivanova's business. Customers are calling to ask if their flights out of the country could be canceled. But many other people here are unfazed, desensitized by years living so close to the conflict, according to Ivanova. "It isn't so scary for us now," she said. "A lot of people believed there would be some escalation in the situation with Russia, but we just didn’t know what form it would take." Kalugin says he hasn't heard any reports of property being seized, or in fact any changes on the ground at all. But with elections nearing, he says he is still concerned about the parts of the law that could limit political rallies and mass gatherings. "I think the situation happened and now Poroshenko is trying to get as much benefit from it as possible," he said. "It seems to me that escalation of the conflict isn't advantageous for either side. It’s more beneficial for [Russia and Ukraine] to keep it frozen." Another resident of the city, Evheniy Dzyha, is also thinking about his future. Dzyha, 45, an actor at the city's theater prepping for a role as Santa Claus in a Christmas-themed show for children. He is also an army reservist and veteran of the war in eastern Ukraine. He says he has been preparing to be called for active duty. "I have my go-bag ready," he said. Dzyha is supportive of both martial law and of Poroshenko, says that if anything martial law should have been imposed sooner.